Are you looking forward to a renovation for your Malibu, California home? 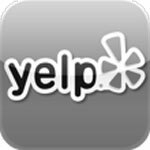 You clearly want top-quality work and a hassle-free experience. And that means a single contractor who can take care of everything from initial consultation and permitting to inspections and final cleanup. 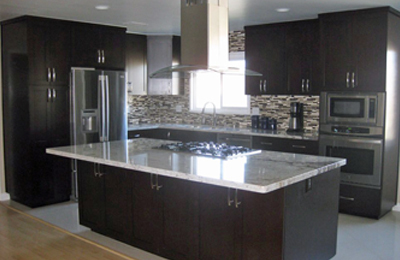 My Space has years of experience as a fully licensed and insured general contractor creating outstanding bathroom remodels, master-suite and other room additions, and kitchen remodels. We deliver quality with only premium materials and fixtures together with expert craftsmanship. 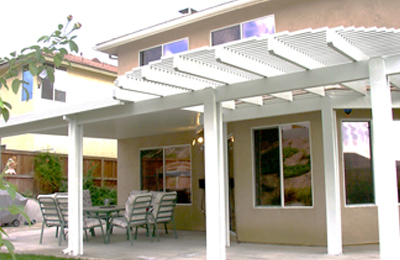 Space and zoning permitting we can provide second floor additions, decks and outdoor kitchens, and more. Work with our in-house experts or your own interior designer and architect, and our experienced project managers will take care of all your Malibu construction, installation, and finish concerns. Everyone wants more living space, but that can be quite difficult with small lot sizes and height restrictions. Where allowed we can construct second story room additions, build down, or build outwards. Expanded kitchens and master bath suites top the list of many Malibu homeowners, and both luxurious old-style and ultra-modern home theaters remain popular. And of course interior decor and exterior style and materials will compliment the existing structure… or look like they’ve always been there. Renovation can bring a totally new style to any space that’s feeling out dated, incorporating features and details you’ve been yearning for. 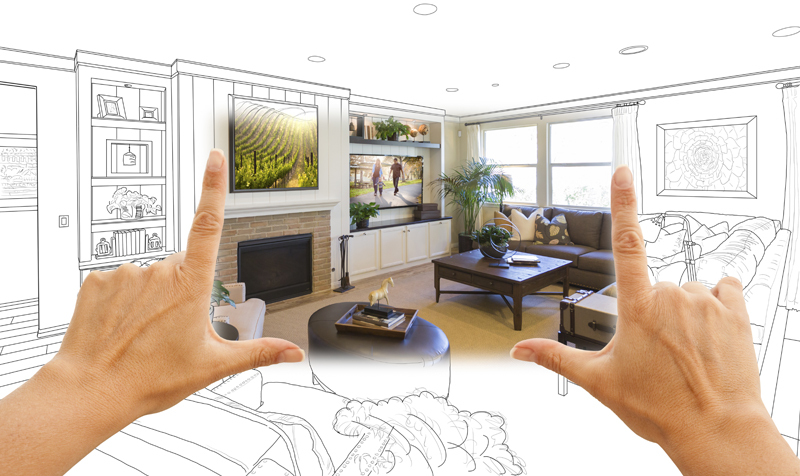 Beyond making more efficient use of limited space, a great home improvement design can feel far more spacious. Sure, the latest designer fixtures and the newest features are great but what people want most out of a bathroom remodel is usually a gorgeous place to relax and pamper themselves. 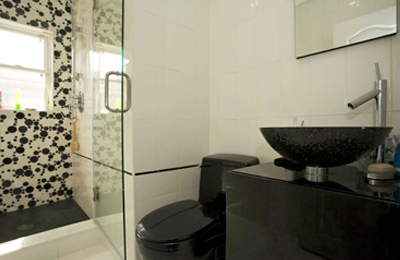 So forget glazed ceramic tile and go for glass or porcelain tiles. Forget laminate or linoleum and choose natural stone or exotic hardwood instead. How about a heated floor that’s warm and toasty right when you get up in the morning? 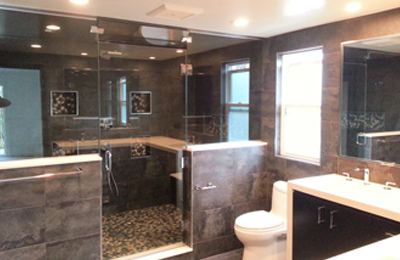 We often receive praise for our custom walk-in showers with seating and rainfall fixtures as well as for our sunken, jacuzzi, and whirlpool tub installations. 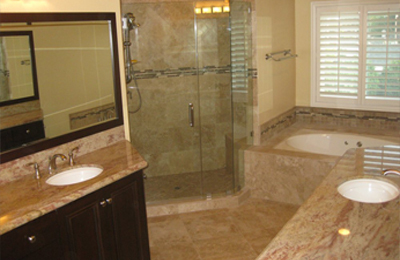 We provide affordable bathroom remodeling solutions for all Malibu, California. 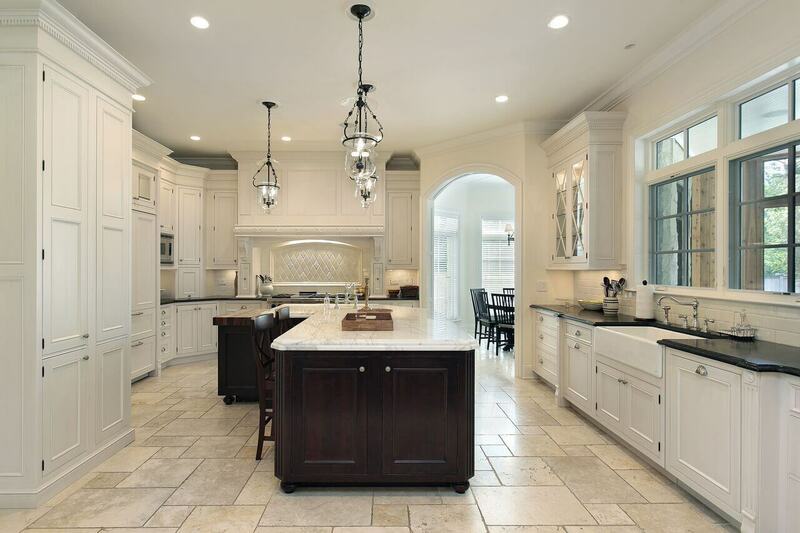 We’re experts at updating or creating an open floor plan as part of a kitchen remodel. Even without expanding the area a dream kitchen welcomes in visitors while entertaining along with loads of natural lighting and stunning Malibu views. Pick a style and we’ll make it happen, floor to ceiling. That could be a contemporary look, ultra modern elegance, something fit for a gourmet chef, or a traditional Tuscan look. 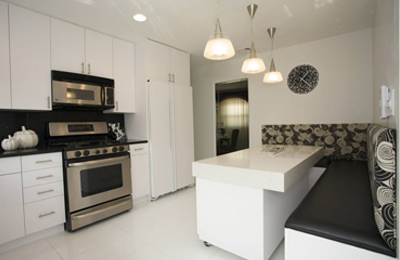 Coordinating colors and materials, you’ll have premium flooring, outstanding kitchen cabinets and counter tops, designer sinks and faucets, and exceptional built-in appliances such as double ovens, grills, and stylish hoods. Working together we’ll make every detail perfect. With extremely few open plots, the choices are often between rebuilding after demolition versus renovation, and most people take the renovation route. After prices went into free fall in 2009, the Malibu housing market has made a strong recovery — as high as 30% in a single year. The average price is now back up over $1,000 per square foot (http://www.trulia.com/real_estate/Malibu-California/market-trends/). For better or worse Malibu California remains one of the most expensive markets, and fortunately appears to have stabilized from those wild swings with a median price approaching $2.8 million (http://www.malibusurfsidenews.com/column-malibu-real-estate-hits-rock-solid-stability). City permits are required for just about any room additions and significant building modifications, including kitchen remodels and bathroom remodels. They exist to protect homeowners as well as the environment, so skipping them even for small projects may lead to extensive, and expensive, re-work later. In Malibu, permits are handled by Building Safety, a part of the city’s Environmental Sustainability Department. A permit application includes submitting plans for review by several city departments regarding codes for safety, energy efficiency, and coastal engineering among others. HGTV’s website provides some great tips for choosing a remodeling contractor, including actually calling a company’s references and referrals. They also list tips for what a contract should include that we’ll mention here.